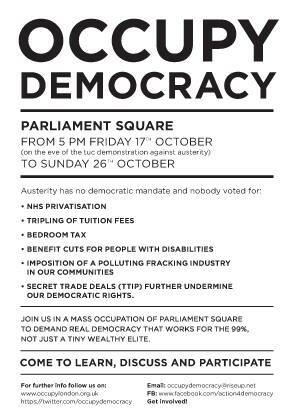 OCCUPY DEMOCRACY – Any youth workers and young people going? Just a few not so innocent questions. Are any youth workers thinking of getting involved? Are any young people thinking of getting involved? Are any youth workers and young people thinking of getting involved together? Are any of the Members of Youth Parliament getting involved? If not, what are the obstacles and constraints? Would such involvement be seen as too political? If so, by whom and for what reasons? Discussing what constitutes an authentic democracy – the power of the people – seems an essential ingredient of our conversations with one another and with young people.